Lane Butcher's spoiled, unhappy, wife wants out of the marriage, but she doesn't want to forfeit the fortune he inherited. In desperation, she strikes a deal with the devil to make Lane commit suicide. Her pact unravels when she fails to live up to her side of the bargain. The marriage ends, but not exactly as she had planned. The unfulfilled pact allows dark spirits to infiltrate the once beautiful mansion. Family members and the household staff experience paranormal activity and most come face to face with their biggest fears. Lane begins to lose touch with reality and the young industrialist retreats to the basement. He refuses to be seen or talk after revealing the unsettling news that the spirits of the damned are trapped inside the house until he dies. After the servants flee in fear and there is no more family left, a non-blood relative is tasked with managing the decaying mansion and caring for a relative she's never met. The idea of living in the vine-covered, unkempt mansion with an insane relative holed up the cellar does not appeal to Corwyn, but she has nowhere else to go. Lane and Corwyn are trapped inside the house by different circumstances and neither one wants to be there alone. Once she discovers the real reason for Lane's retreat from the world, Corwyn believes she can help him. That is, if she can keep her own sanity in a house the town believes to be cursed. The mansion on the shores of the lake has the tragic past to prove those rumors correct. There's only one thing strong enough to break the curse. Love. I would skip this one, unless you like those really crappy endings that leave a whole lot of questions unanswered and a ton of loose ends. The book wasn’t great, but it was decent. Until the end. I need everything wrapped up with a pretty bow, and this one just didn’t do it for me. Whoever edited this book, missed some much needed rewriting. Despite the cliche bad guy, some disturbingly dark scenes (trigger warning: sexual assault), and the sudden climax followed by an abrupt end, The Mansion on Butcher Lake kept me interested and wanting to know how it ended. Hold on to your seats if you pick this one up. It’s a rollercoaster ride of twisted love and unrequited love with a curse that can only be resolved with - you guessed it! - *true love! * I disliked that the mid-1800s heroine said the “f” word without so much as a guilty wince, especially since she was brought up in boarding school. Today, yes, 50 years ago even. But in the mid-19th century? However, I loved that the story’s twists and turns were unpredictable. I would definitely buy from this author again! This was the first time I've read/listened to a book by this author. I was intrigued enough by the story line to look up more on the author and LOVED how she came about writing this book. The author seems like someone I would LOVE to get to know! The story was great, the narrator was very, very good. I look forward to reading more of Goodfellows books! I love it when a book comes alive by the narrator. 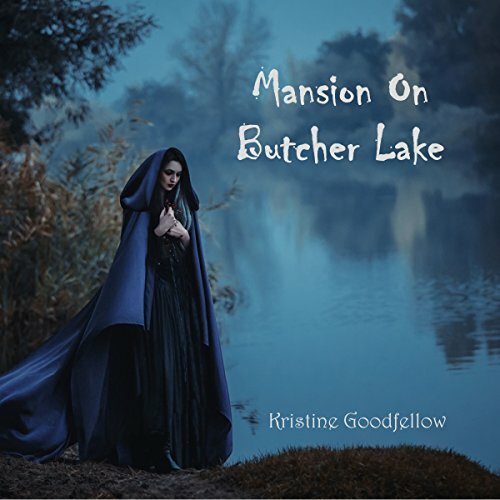 Love the writer and the narrator of this book and the way it came alive as it was read.Great story on this mansion that was forgot about .it will keep you Interested till the end.I truly enjoyed this story thank s to Kristine Goodfellow. Fabulous storyline with great suspense! Loved the twists and turns of the characters. I had read it before but much more exciting in audible!